The Mindy Project lives on! After being cancelled by Fox a few months ago, and then Hulu announcing it was picking up the comedy, the show is back in production. The star herself tweeted that her staff is visiting Hulu, presumably hard at work on the new season. Stay tuned to find out when that will be out! You probably heart by now that Kourtney Kardashian and longtime boyfriend Scott Disick have broken up. Kourtney wasn’t going to let that spoil her daughter’s birthday, though. Penelope turned three, and Kourtney took her to Disneyland, along with cousin North West. It looked like they all had a good time, despite the difficult situation. And finally, do we have a new dress debate going on?! 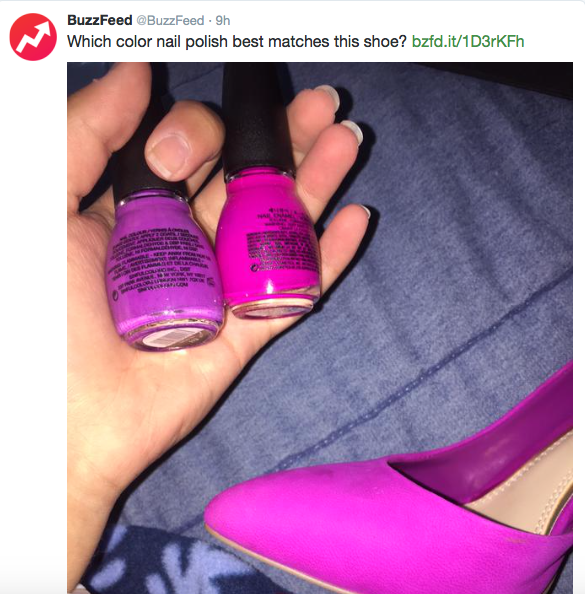 This picture surfaced on the internet of a person trying to match their nail polish to their shoes. The only problem? Both colors look like they match, yet they are obviously different colors. There has been a lot of debate over this so far. What color do you think matches? And do you think Jon Snow lives?! Going through Game of Thrones withdrawal already? 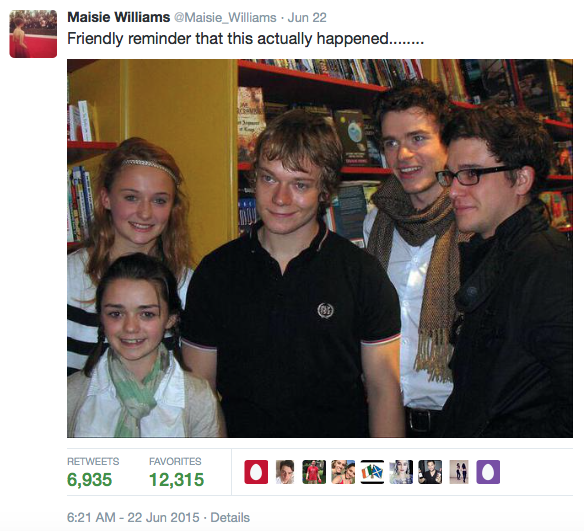 Star Maisie Williams took to Twitter to share this adorable throwback photo of some of the cast members. People are thrilled to see the Stark siblings (plus Theon) back together again. A big story this week is the national debate about whether or not the confederate flag should be taken down in South Carolina. Many people feel very strongly about this issue, and actor John Daley decided to chime in on the subject, quipping that the confederate flag hasn’t been relevant since the Civil War. The backlash over the flag came after the horrific church shooting in Charleston, which was racially motivated. The decision about whether or not to take down the flag will be made soon. Wednesday was Mindy Kaling’s birthday, and her Office co-star Rainn Wilson tweeted her a, um, heartfelt message. “IT IS YOUR BIRTHDAY.” is a reference to an episode of the beloved sitcom, where Jim and Dwight were in charge of Kelly Kapoor’s birthday party and failed miserably. This tweet was a great treat for any Office fan. Taylor announced herself on Thursday that she was going to stream her music on Apple’s service now after this change. Looks like it’s a victory for everyone! So what are your opinions on the confederate flag? And how about the crazy Apple Music/Taylor drama?! Let us know in the comments or tweet us using #glamorouspaper! Sunday night marked the long anticipated season five premiere of HBO’s Game of Thrones. Joe Dempsie plays Gendry, friend of Arya and illegitimate child of former king, Robert Baratheon. Joe, always the jokester, pretended not to know what was on TV Sunday night, and asked fans for suggestions on what to watch. Hopefully we’ll see more of Gendry this season! 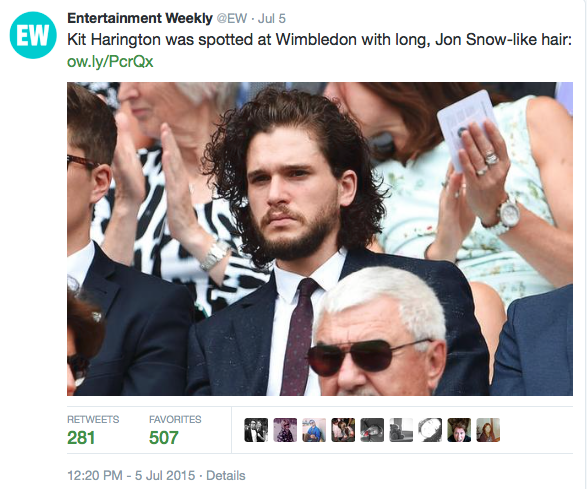 Another Game of Thrones cast member made headlines on Twitter this week. Fan favorite Nikolaj Coster-Waldau finally jumped on the bandwagon and joined Twitter. Nikolaj plays the morally ambiguous but extremely handsome Jaime Lannister. Surely there will be some great tweets to come from him. TV host and comedian Billy Eichner decided to comment on the issue that was definitely the most talked about of the week: Madonna and Drake’s on-stage kiss at Coachella. While everyone was freaking out, trying to figure out if Drake really was that disgusted by Madonna, Billy wrote a snappy tweet that made fun of the whole incident. You go, Billy. 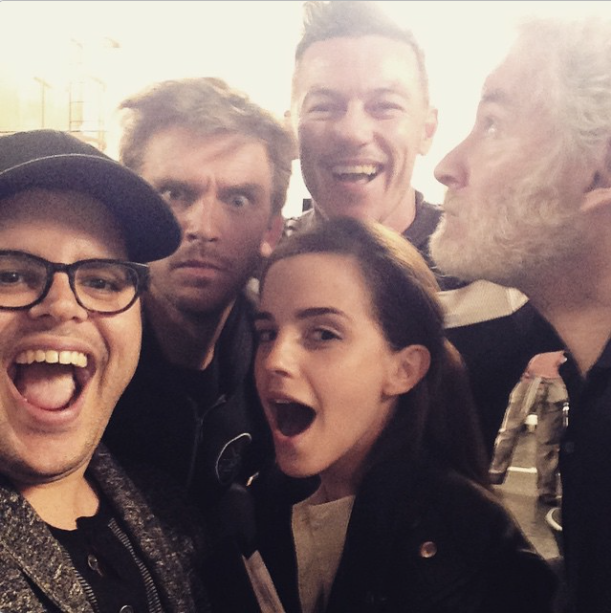 Saying, “Can’t wait for you to be our guest,” Josh Gad tweeted out the first picture of the Beauty and the Beast cast. Everyone was already very excited for this movie, but after seeing this picture, fans can hardly contain their excitement. 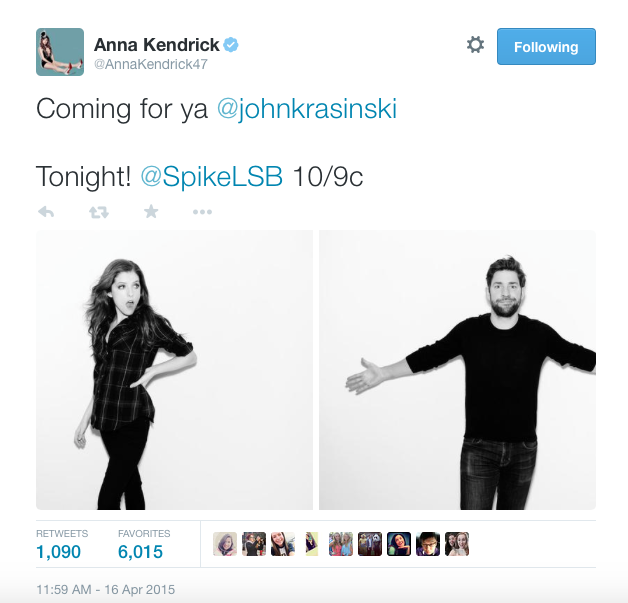 This week on Lip Sync Battle it’s Anna Kendrick versus John Krasinski. These two actors are hilarious so it should be a great show. There’s a clip circulating of one of Anna’s performances. While singing One Direction’s “Steal My Girl,” Anna reveals she is wearing a t-shirt with a picture of her and Emily Blunt in a heart; Emily is John’s wife. The clip is absolutely hysterical and it looks like it will be an episode you can’t miss. Taylor Swift started off the week addressing the ridiculous rumors that she and BFF Lorde were fighting. I mean, come on, those two have the best friendship ever, what would they fight about? Once again, Taylor is the absolute best at showing up the media when they spread untrue rumors. You go, girl. 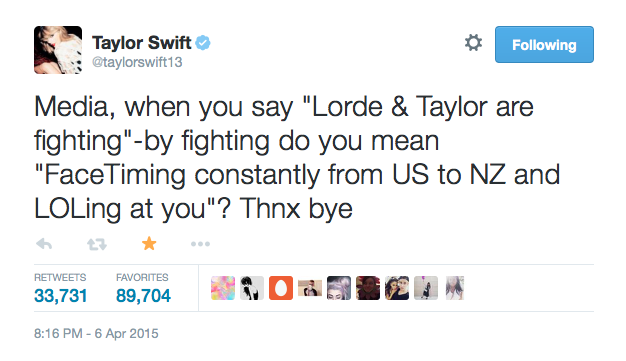 Lorde also chimed in on the issue, confirming that the two are as close as ever with a sassy one-liner. These friends are seriously the coolest, who wouldn’t want to hang out with them? Actress Kate Mara raised some eyebrows when she retweeted and responded to an Onion article, seemingly believing it was real. 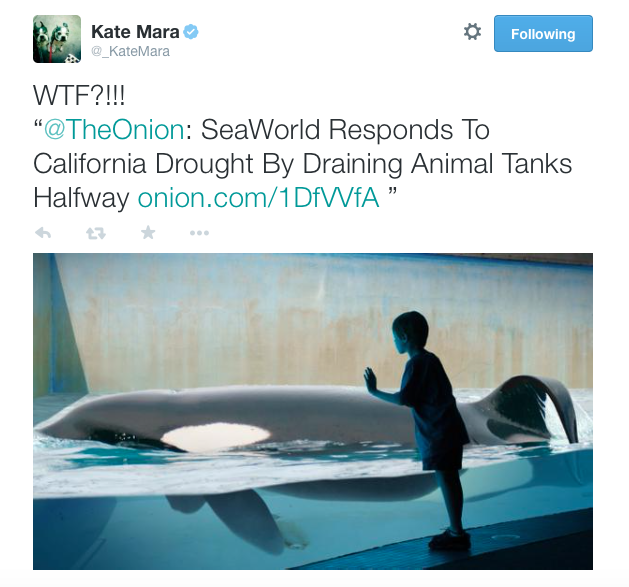 While her concern for the whales is very sweet, almost everyone is aware that The Onion is a satire news site. Dozens of people tweeted back to Kate informing her of her error, some kind, others unkind. So, was Kate just joking around? 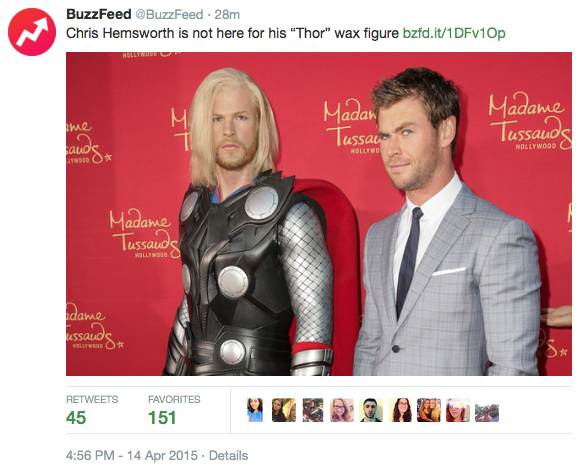 Or did she really think this article was real? …And she was kidding. It’s pretty funny when you read all the crazy responses she got. I guess no one will underestimate Kate Mara again. On Wednesday, the date was 4/8/15, a day Lost fans have been waiting for for a decade. Why, might you ask? If you were a fan of the show, you know that Hurley’s infamous numbers that he won the lottery with were 4-8-15-16-23-42. On Wednesday, at 16:23 and 42 seconds, all of the numbers aligned. Fans everywhere were freaking out about it, and some cast members chimed in to celebrate as well. Daniel Dae Kim, who played Jin Kwon on Lost, tweeted in celebration of the day. Fellow cast members Henry Ian Cusick and Jorge Garcia also took to social media to wish fans a Happy Lost Day. Hope you celebrated, this won’t happen again for a hundred years. 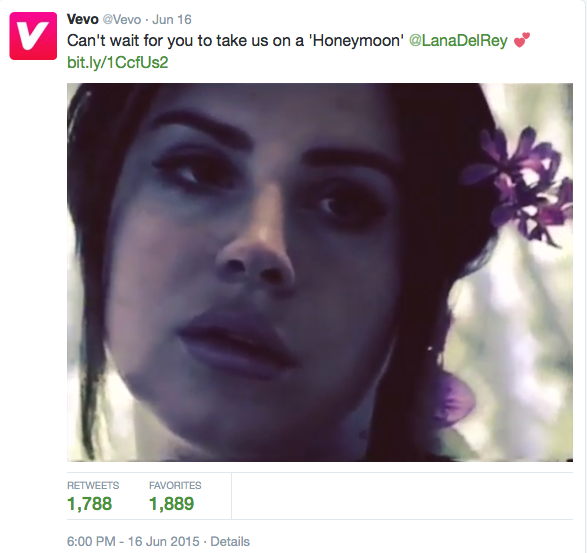 What did you think of this week’s tweets? And would you invite Jon Snow to your dinner party? Let us know in the comments or tweet us using #glamorouspaper!